Lance Cpl. Nathan A. Douthit, a combat marksmanship coach at the Combat Centerâs Marksmanship Training Unit, coaches Staff Sgt. Eric B. Deleon, the segregations chief for the Center Magazine Area, during the known distance course of fire Jan. 10. 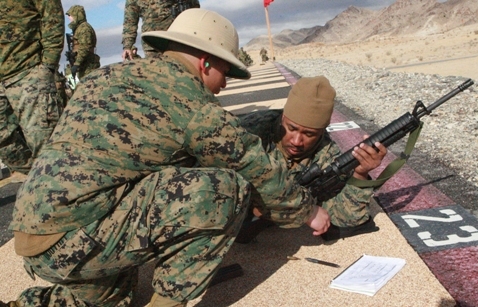 The Combat Marksmanship Coaches course is a three-week class which offers two courses through the MTU, allowing Marines to become coaches and trainers for their units.